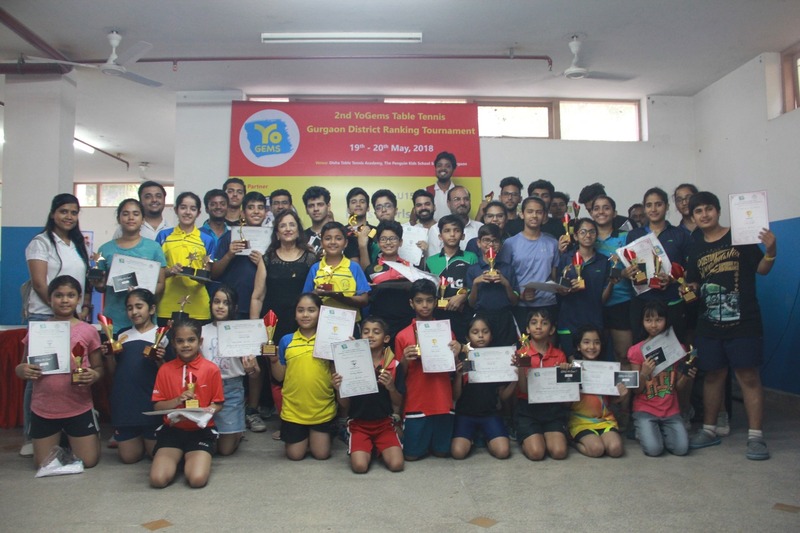 Guragon District Table Tennis Association and YoGems are organising District Ranking Table Tennis Tournament at the Disha Table Tennis Academy, The Penguin Kids School, Gurgaon from May 19th to May 20th, 2018. Around 250 players from over 40 schools are taking part in the District ranking tournament, Winners will represent Guragon in state tournament. On Day 2, Girls U10, U12, U15, U18, U21 and Boyz U10 started in the morning and Semi-Finals were played for all the categoires. Following are the results for each category. Pratyush Pande and Lakshit Agarwal were second runner up. Romilla Roy and Nitya Arora were second runner up. Krishav Nayar and Sahil Gudara were second runner up. Sangmitra Bhattacharya and Vidisha Gupta were second runner up. Siddhant Kataria and Pratham Bansal were second runner up. Pehar Jhamb and Prachi Pathak were second runner up. Utjarsh Kapur and Raghav Bajaj were second runner up. Suvidhi Mehta and Gursimar Kohli were second runner up. Vikas Sheoan and Vatsal Chopra were second runner up. Parinita Saini and Gurimar Kohli were second runner up. Table tennis association secretary Shri Prashant Yadav informed us that history is created in this tournament. This is the first paperless tournament in Gurgaon. Prizes were distributed by Shri Kalyan Singh, Charman District Table Tennis Association, He annouced that under the leadership of Shri Dushyant Chautala and Shri M.P.Singh our national teams (men/women) won gold medals in the recently concluded common wealth games at Gold Coast. This tournament is completely digital on the line of Digital India. Players are being able to check score live on their mobile phone or computers. Umpires are using high tech scoring devices to digitally capture match cores. Draws and Match list are being updated in real time at www.YoGems.com. This is a completely paperless tournament with electronic score display available at the venue.